Having an outdoor house master water filter is very important nowadays to ensure clean water is available for all household used which include washing, showering, cooking, laundering and drinking. Mommy Jane had installed outdoor house master water filter for almost 10 years now and every 5 years, Mommy Jane will change the master water filter to a new one to ensure the water is always clean and the filter system can performed to its max. Recently, Mommy Jane came across a master water filter, FRP942 Sand Filter which was supplied by Aqua Kent RO Malaysia. FRP942 is a robust and reliable outdoor water filter. It ensures durability externally and internally. The internal multimedia filtration system that undergoes a pressure filter vessel utilizing more than 3 different mediums to filter out our water to ensure it's optimum cleanliness and purity. Anthracite absorption and high precision which can remove particles, colloidal impurities, suspended solids or removing iron and manganese. While trapping the sediments, being the primary function of the carbon, it leaves some chlorine water. Turn the MPV to backwash mode. This enables the inner sediments to be flushed out from the system. This will only take 5-10 minutes. Next, turn the MPV to rinse. This ensures the water goes through another filtration process to make it safe and clean for consumption, with the same duration of 5-10 minutes. This last filtering processes completes the backwash process as a whole. This system will remain good as new once this is carried out. Water will be clear and safe for consumption. Aqua Kent RO Malaysia has the longest proven track record for best products and services in the Water Industry Market. Their selection of products include Shop Quality Hot & Cold Water Dispensers, Water Purifiers, Outdoor & Indoor Water Filters, Water Cooler, Air Purifiers and Vegetable Food Purifiers. We can rest assured with their quality after-sales service. Aqua Kent Outdoor House Master Water Filter, FRP942 Sand Filter was price at RM852 but they are having promotion now at only RM585 which is almost 30% discount with warranty up to 10 years. Means that our whole household water used will be safe and clean for less than 30 sen per day if we used it for 5 years. You can make your purchase at HERE. For more information and details, do visit their website at www.aquakentro.com.my and facebook page at www.facebook.com/AquaKentROMalaysia. You can also call them up at 03-40322580 / 019-3211580 or enquiry@aquakentro.com.my. Aqua Kent Outdoor House Master Water Filter had the extra large capability to filter the water throughout my entire house. 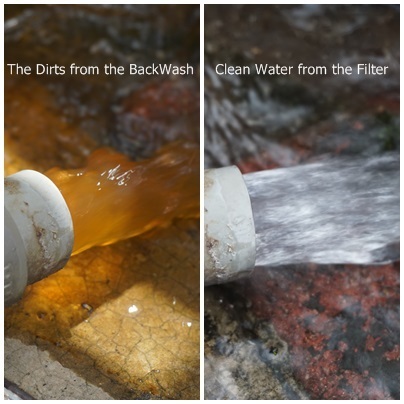 The filter captures sediment, odor, chlorine taste, rust and dirt. It had provided my family with clearer, cleaner and better tasting drinking water to keep my family healthy always. i always see people put this at their pipe outside of the house. but i dont really know how it works. thank you for info ! Nisa, you're most welcome. It is good for every household to own this to stay healthy. Very important the water filter to have a good health in our life & daily routine. Lia, agreed with you especially the water from our pipe is so dirty nowadays. Linda, betul. Very clean and the price is affordable too to own one. Iday, betul. Besides consume, it is good that we use clean water to avoid infections. Kak Fas, agreed with you. Our family health is the most important things in our life. Ya, water filter is a must have nowadays. Thanks for your review. Best nya kalau dapat pakai water filter ni. Tak dinafikan ada masa air paip agak sedikit kuning. Afizah, harganya berpatutan. You should have one for long term investment. Amanda, it is indeed good. Maybe you should educate your parents for the benefit of your family health. Last time is different than today. More chemicals involved and the water is not clean anymore. I also use water filter at house. memang bersih air. Tarzan, goid to hear that to stay healthy. Perhaps you can share it with your friends and hopefully more peoples will aware the importance of having it in every household. Bella, agreed. Most have it but still got minority of premises yet to have it till now.